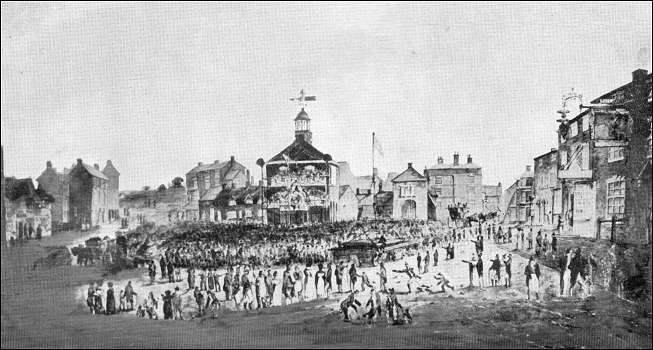 The illustration above shows the first Town Hall in 1843.
the meat market can be seen behind. 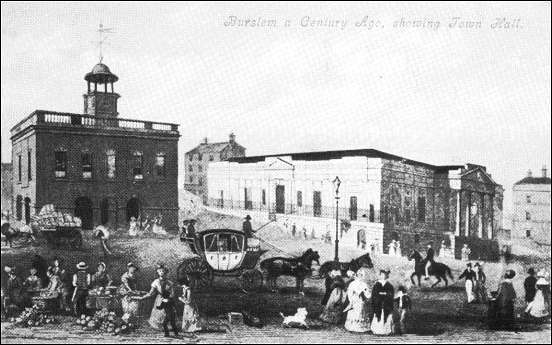 "Peace rejoicings at Burslem, Staffordshire, 1814"
from "Ten Generations of a Potting family"
"In the year 1760, the more opulent inhabitants set on foot a plan for erecting a public Building, in the present Market Place; in furtherance of which, they presented a memorial to Sir Nigel Gresley, Bart., and Ralph Sneyd, Esq., the Lords of the Manor, praying a grant of a piece of waste land "where the Maypole did formerly stand," on which to erect a piece of building for a School, stating that there was but one School in the Town; for which reason, two parts of the children out of three were put to work without any learning... But the object for which the grant was solicited. seems to have undergone some extension; for in the Lease which followed this application, and bears the date the 24th June, 1761, a piece or parcel of waste ground, situate in the Town of Burslem, opposite to the dwelling-house of John Shrigley, containing in length 16 yards, and in breadth 10 yards, is demised to 30 Trustees, for the term of 500 years, at the yearly rent of sixpence; with power to such Lessees to erect thereon a public edifice, or building, for a Market Hall, School, or such other public use and purpose, as should be thought needful; and to enclose a court, or yard, to the same, from the adjoining waste land, not exceeding 8 yards in breadth, from the side or end walls of the building. 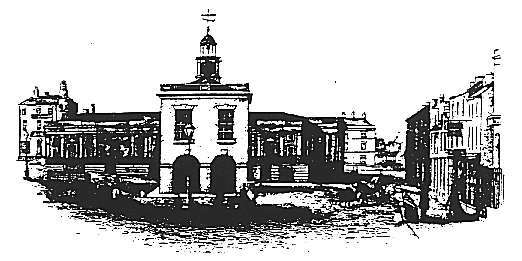 Thus originated the present Town-Hall of Burslem. The exterior has, however, undergone subsequent improvements, by the coating of Roman Cement, a slated roof, (supplanting the old tiled one,) with a balustered parapet, an elegant cupola, and a new clock with four dials, one of them illuminated; and the building now presents a handsome appearance to the eye of the passing stranger, as the plate introduced hereafter indicates. The upper story is partitioned, and the east end used for the Police-Office. The other portion is a large and handsome room, in which public business is transacted, and the Magistrates hold their sittings. The arched basement is partly used as lock-up rooms for delinquents.